State Bank of India is the India's largest public sector bank. Modern day banking has made it easy to withdraw cash and do transactions through the ATM. This technology has been enabled with help of the Debit Cards. There are two types of Cards which are usually used by people. One of them in debit card and the other one is a credit card. In the debit card, a person transacts with the money which is already in his account and in credit card a person takes a credit from a bank for a certain period of time. In this article, we are going to talk about how you can find out the CVV number and the Expiry date of your SBI Debit Card. SBI debit card can be used for a wide range of transactions. For all the offline transaction you only need your ATM pin whereas for all the online transaction you need to have the expiry date of the card along with the CVV number. Without these details, it is impossible to make online transactions with the card. Below are the steps listed for finding the CVV Number and the Expiry Date of the card? 1. To find the expiry date of the card, you should have your debit card with you. 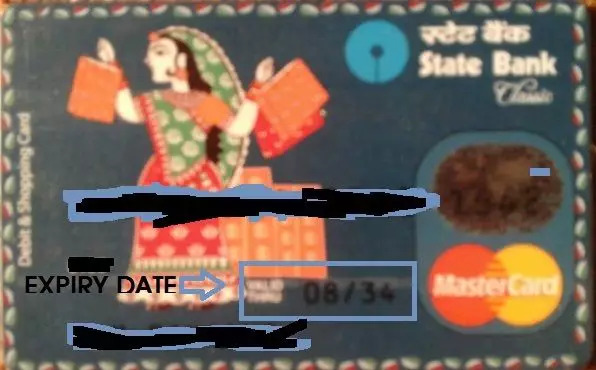 The expiry date of the card is mentioned in the front of the card. 2. To find the expiry date, check below the 16 digit card number. You will see two dates in "MM/YY" format. One of them is the issue date and the other is the expiry date. 3. Check the date under which it is written: "Valid Thru" or "Expiry". This will be your expiry date. You can also check if the card is valid or not by checking the expiry date. 4. You would not be able to use the debit card if today's date is past expiry date of the card. 1. CVV number is a security code which enables secure transactions. Without the CVV Code, it is impossible to transact online. CVV stands for Card Verification Value and it is usually a 3 digit code. The exception, in this case, is the American Express Card for which the CVV code is a 4 digits code. 2. To find the CVV code, turn around to the back side of the card. 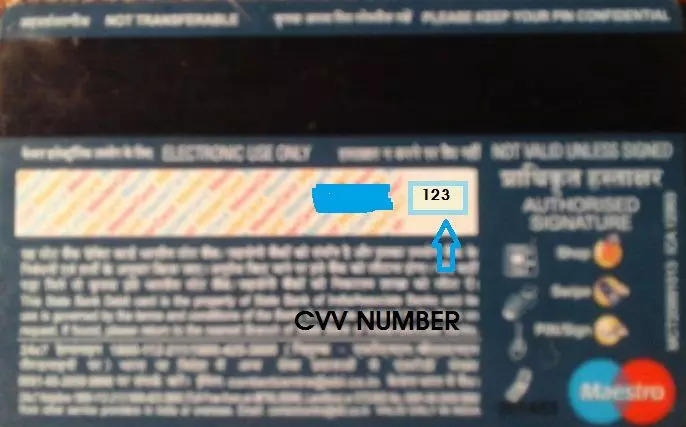 The CVV code is usually mentioned below the magnetic strip. It is just across the signature strip. In the new cards, the signature strip is absent hence you can find the 3 digit code just below the magnetic strip. Now you have your Expiry Date and CVV Code hence you can now do any transaction. Just make sure that you never share these details with anyone as they can be used for fraudulent transactions also. It is important for you to keep these details a secret and in case you have lost your card, it is not possible to recover the expiry date and CVV. You need to block your card and get it reissued from the bank. how to find state bank master card expiry date? I have sbi card but there is no cvv numbeer how can i get that number? i have sbi classic credit card . on backside of debit card two no printed one is of 4 digits & one of 3 digits . how can i judge which is cvv no ? if i use 3 digit no it shows wrong . what i can do? 3 digit number is your CVV number. How to find cvv number on sbi rupay debit card ? i have a sbi debit card but cvv/cvc no is not mentioned in the back side of the card so, tell me what i do? How to Find my cvv number of sbi credit card. how to find state bank visa card expiry date? Where is expiry date. Is it same as like sbi credit card.